The Hoyo de Monterrey Palmas Extra is a delicious and affordable medium Habano, with a 40 ring gauge, 5.5” (140mm) long and comes in a box of 25 cigars. A very nice Corona, that has a strong woodsy flavor, coupled with a subtle spiciness. Never too strong, nor too complex, this vitola appeals to all Cuban aficionados, that are looking for an everyday smoke easy on the wallet. The Hoyo de Monterrey Palmas Extra is a very good option for a cheap morning cigar. • Delicious and strong flavors of wood, in addition to spiciness from pepper and from typical Cuban twang. • Ages very well. After many years, the Palmas Extra develops a creamier and more complex flavor profile. This cigar simply delivers a savory Hoyo de Monterrey experience at a lesser cost. The Hoyo Palmas Extra has a nice and attractive dark brown (Colorado Maduro) wrapper. The wrapper looks very well rolled, rather oily and smooth to the touch. A few small veins are apparent, but this is no big deal. It feels well packed from head to foot, with just the right amount of give when squeezed between fingers. The beautiful red and golden Hoyo band gives to this vitola a very elegant look. Aromas of sweet tobacco emanates from the wrapper, there are also some notes of chocolate, wood. On the foot, some fruits, coffee, spices and few hints of nuts. The cold draw is smooth, just tight enough, and also brings some spicy flavors on the palate, some nutmeg and some delicious tobacco. It leaves some saltiness on the lips. Cutting the cap is very easy and leaves a neat cut. Setting the foot on fire is equally effortless; a nice charcoal shows up at the tip of the cigar. The first few draws bring some darker flavors, some black coffee, some wood. It is still very salty, with some herbal notes as well. The Hoyo Palma Extra generates lots of thick smoke from the get-go. The burn starts off slightly wavy, but as the cigar goes on, it requires just one or two touch-ups in order to remain straight. After the darker flavors from the first few puffs, the flavors mellow out and are now more sweet and creamy. The main flavors in the first third are of wood, coffee, nut (mainly walnut), with some notes of spiciness, slowly ramping up. The body is at a medium level. The ash has a nice grey color and holds on until the second third. The smoke is still very abundant and the draw remains perfect. In the middle third, the flavors mellow even more, towards mild to medium, the saltiness from the first third has recede to the background and there is now more creaminess. Lots of sweet and creamy flavors, some wood, spices, nuts, coffee and some citrus notes. The burn and the draw are still optimal and the cigar continues to release plenty of smoke. In the final third, the flavors increase a bit, and the body too, around medium. In terms of flavors, the sweetness has disappeared and the flavors are closer to those discovered at the opening of the cigar. Still plenty of coffee, wood and toastiness. 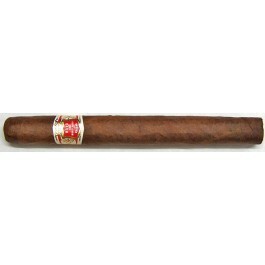 The flavors are overall still very creamy and typical Hoyo. There are also some fresh notes of fruits. A beautiful ending to a refined cigar.